호수를 따라 나무 도크에서 실행중인 젊은 여자. SLOW MOTION: Unrecognizable woman jogs barefoot along sunlit tropical beach. LOW ANGLE: Unrecognizable woman running barefoot along the sunlit sandy beach. POV: Unrecognizable woman holding you by the hand while walking towards beach. 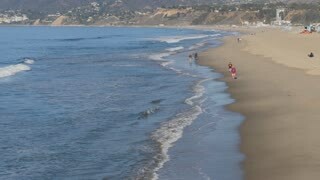 A daytime slow motion establishing shot of Santa Monica beach with tourists walking along the shore. Shot at 60fps.